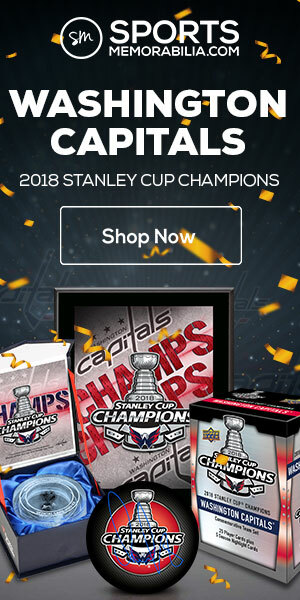 The Cup tin/pack prices are so expensive that they are beyond most collectors budgets. 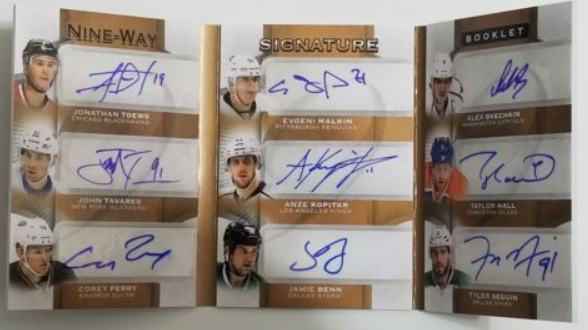 For those who were lucky enough to afford them in 2016, came the chance to pull this amazing multiple autographed card that contains nine of arguably the biggest current superstars in the NHL. 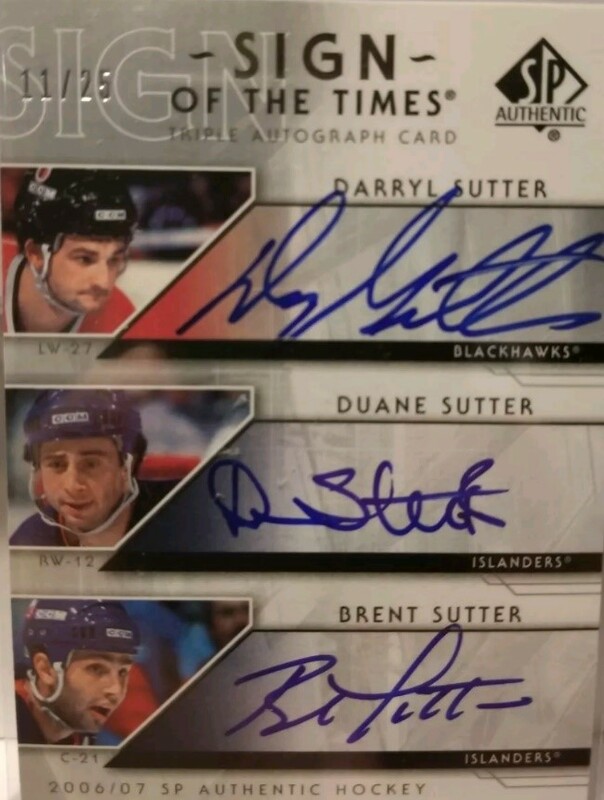 Imagine one card that contains autographs of multiple captains, multiple 1st overall draft picks, and multiple NHL award winners. Signatures include Jonathan Toews, John Tavares, Corey Perry, Evgeny Malkin, Anze Kopitar, Jamie Benn, Alex Ovechkin, Taylor Hall, and Tyler Seguin. Fittingly numbered to just nine copies. 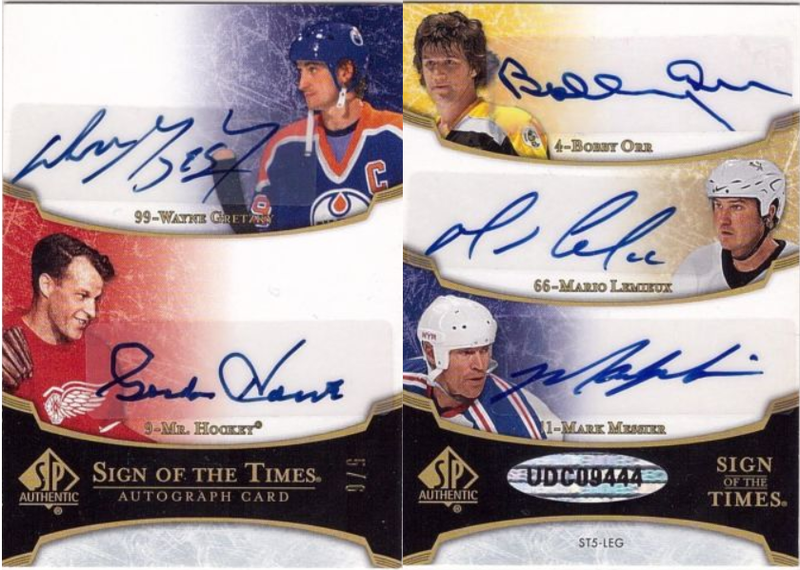 In keeping the Nine-Way Signature Booklet concept going, a few seasons later Upper Deck took the idea to yet another level by combining autographs of three of their original six, three modern, and three current Toronto Maple Leaf stars. This version includes Frank Mahovlich who is one of the 100 Greatest Players in history, Red Kelly who played on an astonishing eight Stanley Cup winning teams, and probably the most beloved Leaf of all time, Johnny Bower. Added onto this amazing card are some 1990’s stars including: Hall of Famer Doug Gilmour, tough as nails former Leafs Captain, Wendel Clark, and the last Leaf’s goalie to get the team close to a Stanley Cup, Felix Potvin. 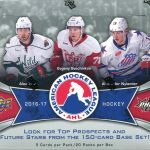 Rounding out this amazing card are current Leaf young stars Mitch Marner, William Nylander, and Fredrik Andersen. Once again, this card is numbered to just nine copies. The front of this “quint” autograph can be described as the best of all time. Wayne Gretzky shares his autograph on the front of this card along with the autograph of his childhood idol Gordie Howe. Throughout his career, Gretzky chased and eventually passed the man known as Mr. Hockey on the NHL’s all-time points and goal scoring lists with Howe retaining the all-time games played record, even through today. The back of the card contains just a few other guys that may sound familiar: Bobby Orr, who might have been the greatest player to ever play the game: Mario Lemieux, widely considered the most talented player ever; and Mark Messier, who most agree was the greatest captain to ever play the game. This amazing pull is numbered to just six copies. When you think of the greatest teams in NHL history, the Edmonton Oilers dynasty from the 1980’s are an easy pick. When you break down the best players in Oilers franchise history, Wayne Gretzky, Mark Messier, Grant Fuhr, Paul Coffey, Jari Kurri, Craig MacTavish and Marty McSorley represent almost the entire top ten list. Oilers collectors have to be diligent to get a copy of this one as it is numbered to just 6 copies. 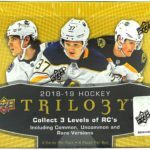 Trilogy has always been a unique set with a great mix of inserts and rookies each year. 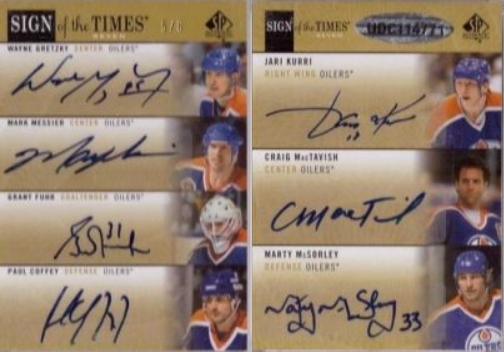 Upper Deck has included autograph’s in several Trilogy sets and they are incredibly condition sensitive (auto’s smudging or scratching off the clear acrylic card surface). 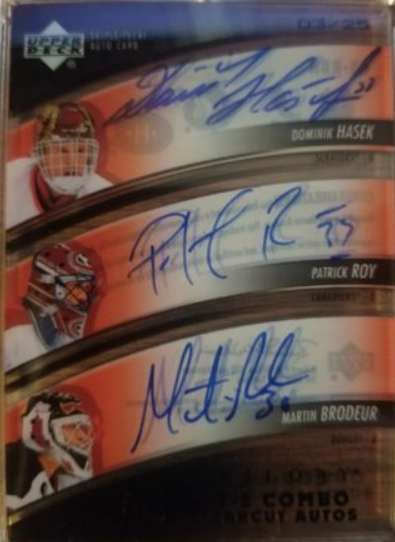 This version includes three of the greatest goaltenders to ever play the game, including: multiple Vezina Award and Stanley Cup winner, Dominik Hasek; three time Conn-Smythe Award and Stanley Cup winner, Patrick Roy; and last but not least, Martin Brodeur, who is considered the Gretzky of goalies as he owns practically every NHL all-time goaltending record. This card is numbered to just 25 copies. This is one of the few autographed cards that contains both Boston Bruins star defensemen, Bobby Orr and Raymond Bourque’s signatures. Bobby Orr is widely considered the best defenseman to ever play the game, scored the most memorable Stanley Cup winning goal of all time, and some would even argue that he was the best player ever. 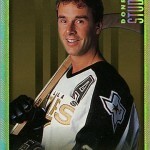 Adding to this card’s appeal is Bourque’s autograph. Bourque was a Boston Bruins first round draft pick and spent the majority of his Hall of Fame career in the NHL as the captain of the Bruins, until his trade to the Colorado Avalanche which finally enabled him to win a Stanley Cup. This dual-auto is numbered to 75 copies. That is not a spelling error in the title of this card. It is a “Duel” autograph as well as being a dual autograph. 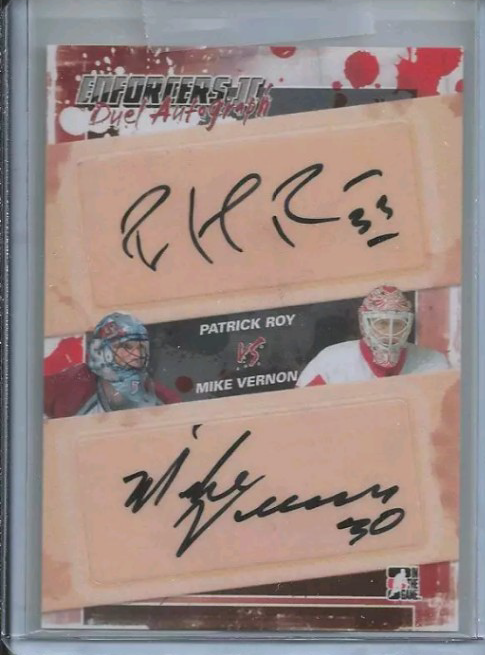 Celebrating the greatest goalie fight I (and almost every other hockey fan) have ever seen, this autographed card from In the Game includes Patrick Roy and Mike Vernon. The fight occurred during a game in Detroit on March 26, 1997, just 301 days after the infamous hit that Claude Lemieux delivered to Kris Draper. 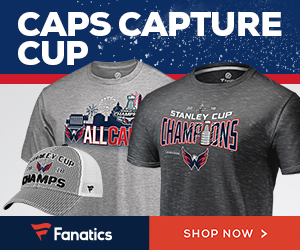 That hit was the match that ignited the hatred between these two teams, which continued for several seasons in the late 1990’s and is one of the greatest rivalries in NHL history. After Roy stormed from his crease to assist his teammate Claude Lemieux who was turtling, oh sorry, “fighting” with Darren McCarty, Vernon took it upon himself to ask Mr. Roy if he wanted to dance as well. What followed was an intense, back and forth fight where both players wound up bloodied. This card is from the short printed Enforcers II subset that In the Game released including players that fought each other with regularity. These cards are all unnumbered. I had to throw in a card from this set as it is probably the most unique autographed set ever produced and they are all very affordably priced. These oversized packs came with several standard sized cards as well as one certified autographed 8×10 card. Single, double, triple and quadruple autograph versions were available. 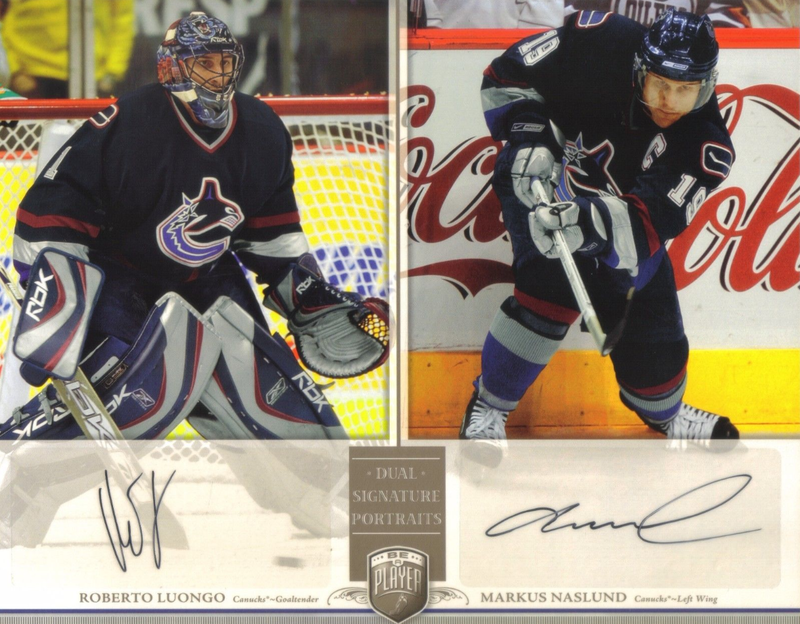 There are a ton of great dual autographs from this set including two of the all-time greatest Vancouver Canucks, Roberto Luongo and Markus Naslund. These cards were not numbered. 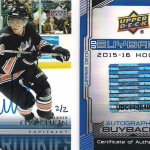 There are a ton of affordable multiple autographed cards but none have more bang for your buck than the Upper Deck Rookie Update Dual Autographed RC’s that came out in a few different update sets. Pairing the autographs of a superstar at the time with a “can’t miss” rookie made for an incredible combination, with the cherry on the top being the fact that they were also true RC’s. 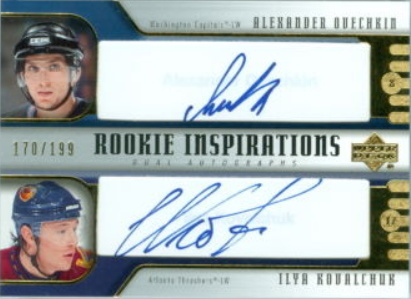 Alexander Ovechkin’s autographed RC from this set also includes an autograph of Ilya Kovalchuk. Jason Spezza’s RC was paired with none other than Wayne Gretzky. 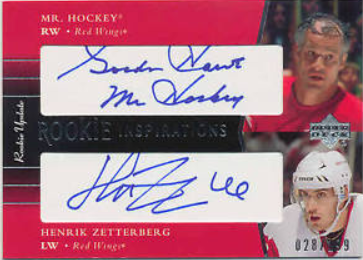 Other notable dual autographed RC’s from these sets include recently retired Detroit Red Wings captain, Henrik Zetterberg who was, of course, paired with none other than Mr. Hockey Gordie Howe. 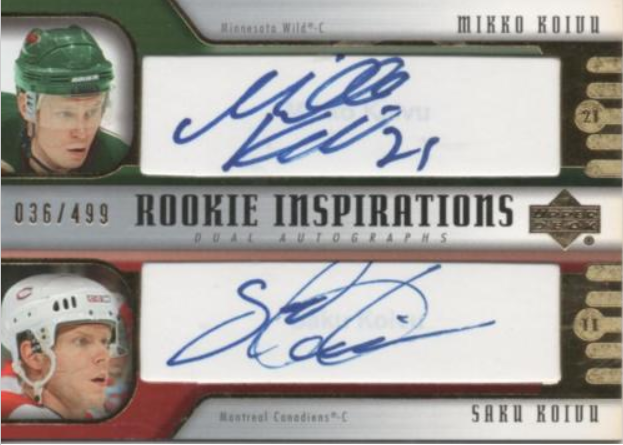 This set also includes the only RC to contain brother’s autographs with current Wild Captain, Mikko Kouvi appearing on his RC with his older brother and former Montreal Canadiens captain, Saku Koivu. As special as these are, they are numbered to either 199 or 499 copies. In a strange turn of events, Sidney Crosby’s autograph RC from this set only includes his autograph with a “2005 #1 Pick” hand written note taking the place of the second autograph. 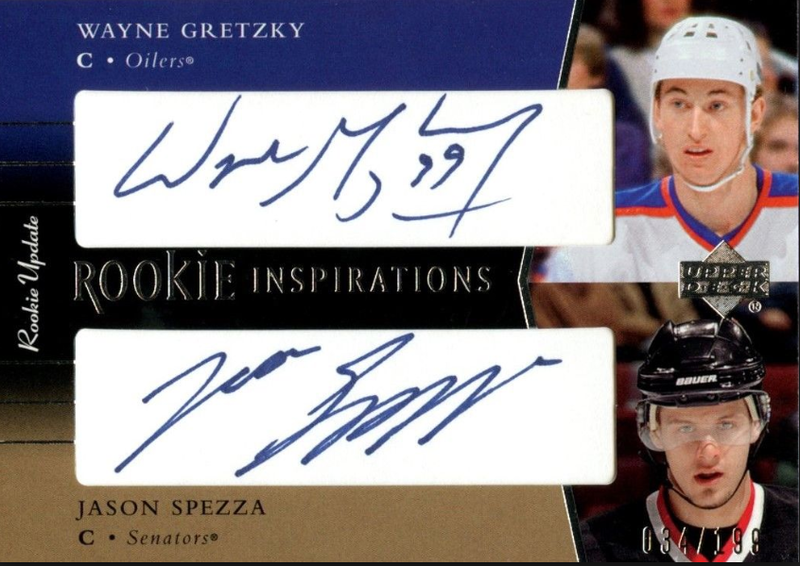 I assumed this may have to do with the fact that Gretzky had already appeared in a previous set (Jason Spezza RC) or maybe Sid wasn’t interested in sharing his RC with anyone else. Though, it begs us to wonder, how amazing would a Sid the Kid RC have been with both his and Mario Lemieux’s autograph on it? 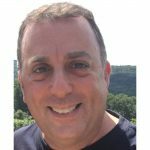 Follow Larry Berman on Twitter @PaigesFall. If you own all of these as part of your collection, I am forever jealous and might as well stop collecting now. Hi Gremlin, I only own a few of the ones towards the end of the article. Thanks for reading. just wondering who knows how many 08-09 Patrick Kane rookie auto buybacks were put out? Previous Previous post: Blake’s Takes: Goals, Goals, Goals!